This is a book about how holding on to secrets—no matter how much we tell ourselves we are doing it for the good of everyone else—builds walls around hearts and relationships. Jenna and Sarah have spent the past six years with distance—both physical and relational—between them. When news of Jenna’s death reaches her family, Sarah is surprised and confused by the insistence she travel from Washington to Bolivia to spread her sister’s (the one who has wanted little to do with her for years) ashes and collect her belongings. 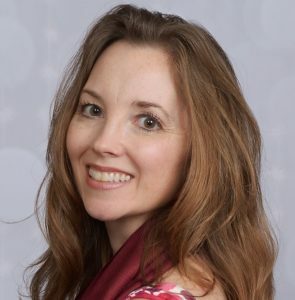 Katherine Scott Jones gives readers a book filled with flawed and broken characters who are relatable enough to garner our compassion. As secrets are uncovered (the book alternates between Sarah in the present and Jenna through the years in the past without bogging the reader down), Jenna’s pain and guilt are laid bare for Sarah to see. 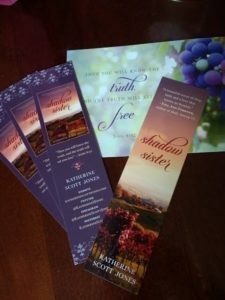 Shadow Sister also gives us a peek into the lives and challenges of the Bolivian people and the hearts of those who commit their lives to serve them. 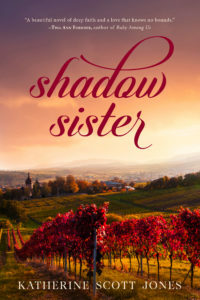 Well written with vivid descriptions of both Bolivia and central Washington’s wine country, this book transported me to new places and mired me in the emotions of one sister who always felt she lived in the shadow of the other. While the other sister lived as a shadow of her former self. I give it the same score. My review will post on September 14.